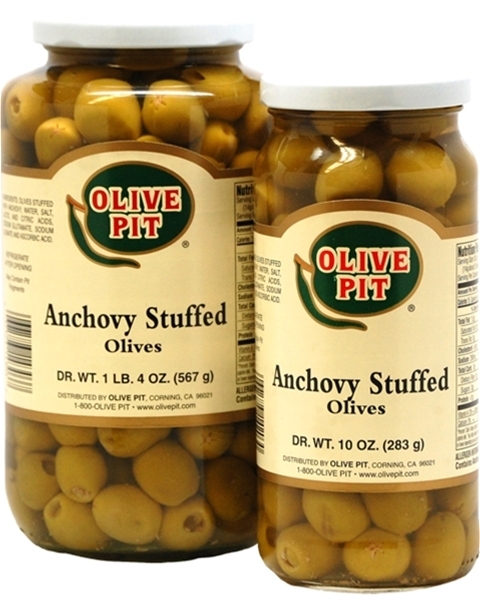 These olives are delicious served as an hors d'oeuvre or added to your favorite pizza! This is my third time of ordering the anchovy stuffed olives. They are wonderful. Your the only place to get them at a reasonable price. Love them in a martini. on 4/2/2016 Tiny umami bombs! Olives already contain a significant amount of glutamate (the "umami" chemical), but the addition of anchovies sends your taste buds into overdrive. To really play up this quality, pair these olives with cheese--slice them thin on pizza, add them to a cheese board, or just skewer them with a cube of medium-hard cheese (I like Provolone) on a toothpick. The combination of olive, anchovy, and cheese presents a triple dose of umami with every bite. A couple of months ago I road tripped down to SFO, and made a stop. Got the large jar of anchovy and the chipotle stuffed. Both are stellar! I eat them like candy, and I am down to TWO olives left, which is a big bummer, but I may make an order. These are better than any of the canned varieties you tend to see in better groceries, and also better than Armstrong anchovy stuffed. Get either of these olives! I miss these so much I have to call and order some shipped to me to keep me happy until next October anyway. Years ago I ran into an inferior batch but you made the situation right for me. I was down that way a month or so ago but changed plans to return via 101. So was unable to get some back up here. Yes they are absolutely terrific with martinis!!! In Spain, every store has several different brands of anchovy stuffed olives, and everyone loves them - even my wife, who hates anchovies. Here in the states, they're almost impossible to find. These aren't quite a good as the Spanish ones, but very tasty just the same.